Palestinians and Israeli left-wing activists try to break down a section of Israel's separation barrier, during a protest to mark the 5th anniversary of protests against Israel's West Bank separation barrier in the West Bank town of Bilin near Ramallah, Friday, Feb. 19, 2010. Atlanta Fred Brooks, an old comrade, and now professor at Georgia State, asked if I would be interested in hearing a visiting speaker, Iyad Burnat, who was a Palestinian organizer of nonviolent protests on the ever controversial West Bank and happened to be giving a talk at Kennesaw State at the international conflict resolution center up there. The meetings that were bringing me to Atlanta were later in the afternoon, so, always dangerously curious, why not? 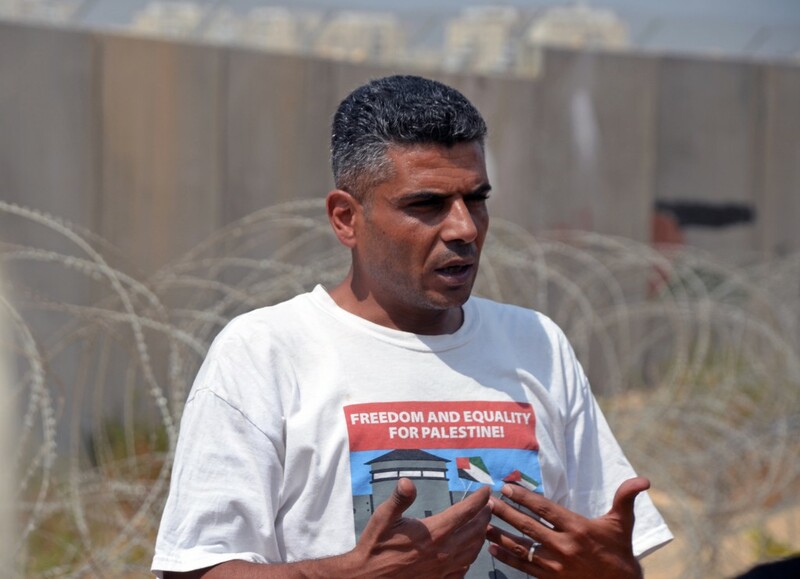 Burnat’s talk focused on the continuous struggle waged by the Palestinian olive farmers in the small town of Bil’in to live and work under the Israeli occupation hemmed in by the wall. In the beginning there was a screen shot projected above him which showed a map around the town. The green line to the left of the screen was the older United Nations demarcation of territory for the Palestinians. The red line some three kilometers farther inland, splitting the Bil’in portion of the map was the wall erected by the Israeli’s to facilitate the wildly polarizing “settlements” we read about constantly in the news. Never having been in this area of the Middle East, I was taken by two things as Burnat scrolled through his pictures and YouTube video taken of their regular Friday protests and demonstrations. In my mind the “wall” was similar to the enormity of the wall being built along the Rio Grande by the United States in order to try to convince Mexicans to stay in Mexico, and that is a 16 foot, concrete and steel monstrosity, permanent, imposing, and so out of place that it seems bizarre. The “wall” we were seeing in Bil’in was often a rickety looking chain link fence with barbed wire on top with a Hogan’s Heroes look about it. The “wall” was all about the ability of the Israeli Army to hold the line in a very, very personal way. The other surprise was that the pictures of the settlements in my mind’s eye had been rural compounds. The pictures of the settlements around Bil’in were multi-story, modern high-rise structures that from a distance would have seemed at home on a California hillside. The actual video that composed the bulk of Burnat’s presentation was depressing in every way. A ragtag, but spirited and imaginative crew of protestors, largely composed of peace movement Israeli supporters and foreigners from all over the world with a smattering of local Palestinians, still willing to brave the almost predictable certainty of arrest and detention for their nonviolent protest, would march or demonstrate near the wall chanting for peace until the bored appearance of the Israeli Army squad would stop and scatter them with tear gas or dismantle their props or cut them loose from the fence or whatever the protest specialty de jour might be. The predictability of the players and the parts almost made these protests seem more media charade than real life drama until, virtually without provocation there would be smoke and, way too often, blood, with protestors falling, hit by USA-made tear gas canisters or rubber bullets. After eight years of their commitment to nonviolence and every Friday protests, the people of Bil’in count as their victory some small progress is moving the “wall,” and from what I could hear, that’s about it. They were buoyed in their efforts by constant and growing support from the Israeli peace movement and the excitement of international visitors from former US-president Jimmy Carter and others, even while their local base seemed increasingly marginal. When I told Burnat, I admired their steadfast commitment to this tactic, but was curious about their real strategy, he replied in several ways. First, he argued essentially that “hope” for change was their plan. Sadly, hope is never a plan. When pressed, he offered a practiced and pat response that they were “farmers not politicians.” When I rejoined that “protest was a political act; you’re no longer farmers,” he gave some more effort to the answer, which was basically that their only plan was what was available to them as a “voice” for their predicament. Their plan was the protests. It’s about all they have, it’s what they know, so it’ll have to do, really whether it was getting anything else done or not. 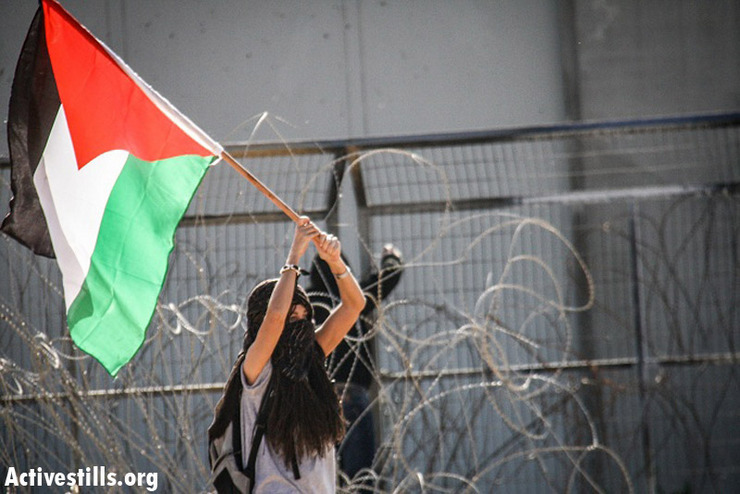 They had to struggle against the occupation, so this is what they would do. I could get that easily enough. Some of his other answers undercut the purity of the position he was trying to stake out. In answering questions from the audience rather than sticking to the “we’re farmers not politicians line, he offered opinions about the Palestinian Authority which denigrated them for not being “on the ground” despite what he had showed us of his own base in Bil’in. He also was negative about the recent United Nations parliamentary and diplomatic breakthrough in terms of delegate status which they won by an overwhelming vote of countries throughout the world virtually isolating the positions of Israel and the United States as recalcitrant. Once again his argument was that it did not change things on the ground, but that misses the point that major campaigns and victories are won by employing a multitude of tactics and strategies. I walked away shaking my head. What a mess we have in the Middle East and sadly there seems no “conflict resolution” in sight.